Professor Anthony Parel in his Gandhi Foundation Annual Lecture 2011, Pax Gandhiana (which can be read by clicking the link at the end of this article), asks to what extent Gandhi’s nonviolence is compatible with the coercion which any state inevitably exercises. He claims that “coercion based on consent is compatible with Gandhian nonviolence”. But when coercion takes the form of physical violence, especially the extreme violence employed by armies, is that really compatible with Gandhian ethics? Gandhi spoke and wrote a great deal as the approximately 100 volumes of his Collected Works illustrates. But he was no political philosopher, rather a man of action so his recorded words are strongly linked to the specific circumstances of the time and place they were uttered. It is relatively easy to find quotations which express contradictory positions. Restricting ourselves to the issue of war, there were three occasions up to 1914 when Gandhi participated in war in some manner. The first was the Boer War (in 1899 and 1900), the second was a Zulu rebellion (1906), and the third was when he was in London in 1914. However in all three instances his participation amounted to raising ambulance units of Indians which I would see as very different from actual combat, although Gandhi did not personally make that distinction. The sole occasion when he did contribute to the armed forces was when in 1918 he tried to recruit Indians to fight on the British side. Without going into the reasons he gave for this, many of his friends and colleagues severely criticised him for this action which ran counter to his long standing advocacy of nonviolent action. Whatever the reasons in this instance (he gave several), the following decades saw him take an increasingly strong stance against war. As Parel points out Gandhi spoke in favour of armed defence on occasion. But I believe that this can be explained by his recognition that most Indians (or people in general) were and are not pacifists like himself and therefore they have a right, or even sometimes a duty, to serve in the armed forces if their country is attacked or threatened. In his speech to the Second Round Table Conference in 1931, which Parel quotes from, he was representing Congress which in general held a much more conventional position than Gandhi himself. 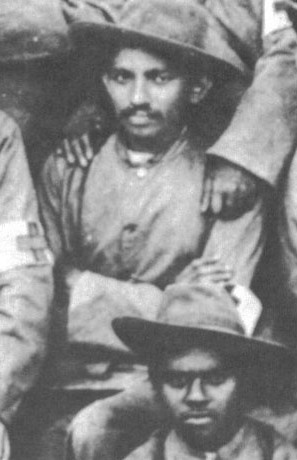 Military defence was however considered by Gandhi to be very much an inferior ethical position. He did not change his position of opposition to violence and war after the Second World War, he had for long held this position. Admittedly, confusion could arise because he held these two positions which many people would see as contradictory, i.e. absolute opposition to war as the ideal which he always advocated, and support for the right to have military defence for those less advanced in their understanding. Under Swaraj of my dream there is no necessity for arms at all. I am an uncompromising opponent of violent methods even to serve the noblest causes. I do justify entire nonviolence, and consider it possible in relation between man and man and nations and nations; but it is not “a resignation from all real fighting against wickedness”. On the contrary, the nonviolence of my conception is a more active and more real fighting against wickedness than retaliation whose very nature is to increase wickedness. My repugnance to war was as strong then as it is today; and I could not then have, and would not have, shouldered a rifle. But the light within me is steady and clear. There is no escape for any of us save through Truth and nonviolence. I know that war is wrong, is an unmitigated evil. I know too that it has to go. I firmly believe that freedom won through bloodshed or fraud is no freedom. Would that all the acts alleged against me were found to be wholly indefensible rather than that by any act nonviolence was held to be compromised or that I was ever thought to be in favour of violence or untruth in any shape or form. I would not yield to anyone in my detestation of war. Q. How could a disarmed neutral country allow other nations to be destroyed? But for our army which was waiting ready at our frontier during the last war we should have been ruined. A. At the risk of being considered a visionary or a fool I must answer this question in the only manner I know. It would be cowardly of a neutral country to allow an army to devastate a neighbouring country. But there are two ways in common between soldiers of war and soldiers of nonviolence, and if I had been a citizen of Switzerland and a President of the Federal State, what I would have done would be to refuse passage to the invading army by refusing all supplies. Secondly, by enacting a Thermopylae in Switzerland, you would have presented a living wall of men and women and children, and inviting the invaders to walk over your corpses. In the 1930s Gandhi advised several governments and their citizens to resist aggression by nonviolent means. This included Abyssinians, Czechoslovaks, Chinese, Jews in Germany, Poles, Norwegians, French, Britons, as well as Indians. I shall take up the Abyssinian question first. I can answer it only in terms of active, resistant nonviolence. Now nonviolence is the activist force on earth, and it is my conviction that it never fails. But if the Abyssinians had adopted the attitude of nonviolence of the strong, i.e. the nonviolence which breaks to pieces but never bends, Mussolini would have had no interest in Abyssinia. Thus if they had simply said: ‘You are welcome to reduce us to dust or ashes, but you will not find one Abyssinian ready to cooperate with you’, what could Mussolini have done? He did not want a desert. Mussolini wanted submission and not defiance, and if he had met with the quiet, dignified and nonviolent defiance that I have described, he would certainly have been obliged to retire. Of course it is open to anyone to say that human nature has not been known to rise to such heights. But if we have made unexpected progress in physical sciences, why may we do less in the science of the soul? But the German persecution of the Jews seems to have no parallel in history. The tyrants of old never went so mad as Hitler seems to have gone. And he is doing it with religious zeal. For, he is propounding a new religion of exclusive and militant nationalism in the name of which any inhumanity becomes an act of humanity to be rewarded here and hereafter. The crime of an obviously mad but intrepid youth is being visited upon his whole race with unbelievable ferocity. If ever there could be a justifiable war in the name of and for humanity, a war against Germany, to prevent the wanton destruction of a whole race, would be completely justified. But I do not believe in any war. … Can the Jews resist this organised and shameless persecution? Is there a way to preserve their self-respect, and not to feel helpless or forlorn? I submit that there is. … If I were a Jew and were born in Germany and earned my livelihood there, I would claim Germany as my home even as the tallest gentile German might, and challenge him to shoot me or cast me in the dungeon; I would refuse to be expelled or to submit to discriminating treatment. And for doing this I should not wait for the Jews to join me in civil resistance, but would have confidence that in the end the rest were bound to follow my example. If one Jew or all the Jews were to accept the prescription here offered, he or they cannot be worse off than now. And suffering voluntarily undergone will bring them an inner strength and joy which no number of resolutions of sympathy passed in the world outside Germany can. I appeal for cessation of hostilities, not because you are too exhausted to fight but because war is bad in essence. You want to kill Nazism. You will never kill it by its indifferent adoption. Your soldiers are doing the same work of destruction as the Germans. The only difference is that perhaps yours are not as thorough as the Germans. If that be so, yours will soon acquire the same thoroughness as theirs, if not much greater. On no other condition can you win the war. In other words, you will have to be more ruthless than the Nazis. No cause, however just, can warrant the indiscriminate slaughter that is going on minute by minute. I suggest that a cause that demands the inhumanities that are being perpetrated today cannot be called just. I have written these lines for the European powers. But they are meant for ourselves. If my argument has gone home, is it not time for us to declare our changeless faith in nonviolence of the strong and say we do not seek to defend our liberty with the force of arms but we will defend it with the force of nonviolence? The present war is the saturation point in violence. It spells to my mind also its doom. Daily I have testimony of the fact that Ahimsa was never before appreciated by mankind as it is today. All the testimony from the West that I continue to receive points in the same direction. The Congress has pledged itself to Ahimsa however limited. I invite the correspondent and doubters like him to shed their doubts and plunge confidently into the sacred sacrificial fire of Ahimsa. I believe all war to be wholly wrong. If the Government had not arrested me in 1942 I would have shown how to fight Japan by nonviolence. A friend had asked if the division of the army and the retention of British officers had Gandhiji’s approval. The friend should first ask whether Gandhiji approved of the army at all. As it was, the military expenditure in free India would probably be more, not less, than before. Gandhiji could never be a party to it. He viewed the military with apprehension. Could it be that India would also have to pass through the stage of military rule? For years they had said that they did not want any army. He stood by that statement even today, but the others did not. One of the scientist members of the staff then asked Gandhiji what scientific men should do if they were now asked by the free Indian Government to engage in researches in furtherance of war and the atom bomb? Gandhiji promptly replied, “Scientists to be worth the name should resist such a State unto death”. I suggest that we hear the true Gandhi in these quotations; certainly the Gandhi that I admire. How far India has travelled away from the path of Gandhi! Of course his message is for everyone irrespective of nationality. These quotations are taken from the two volume Nonviolence in Peace and War published by Navajivan Publishing House in Ahmedabad, the first volume published in 1942 and the second in 1949. Navajivan (‘new life’) Trust was founded by Gandhi in 1929 to spread his ideas. It is a pity that this particular title has long been out of print.